Lockouts from rental any unit are illegal in the City of Chicago. Removing your personal property from the apartment. Lock-outs are against the law, and your landlord can be arrested and fined for locking you out of your apartment. Can I be locked-out if I don’t pay rent? No. Your landlord can evict you for non-payment of rent, but he/she must first file a lawsuit against you, win this lawsuit, and then pay the Sheriff to evict you. Your landlord cannot just lock you out of your apartment. Please refer to Leases for more information. Can I be locked-out for any reason? Everyone in your household leaves the apartment for at least 32 days and no rent is paid for the period you are gone. What should I do if my landlord locks me out? Call the police. If they can find your landlord they will order him/her to let you back into your apartment. Make sure you have something to show the police to prove that you reside in the apartment (such as a rent receipt, utility bill, etc.). You should also call an attorney. What if the police will not help me? Remind them that Special Order #01-04-03 states that they must investigate and end lock-outs. If a police officer refuses to help you, get his badge number, call your local police station, and ask to speak with the Watch Commander. If you are still unsuccessful, call MTO with that information at 773-292-4988. Can I sue my landlord if he/she locks me out? Yes, but you should speak to an attorney first. You can sue your landlord for two months rent or twice your actual damages (whichever is greater), plus attorney’s fees. It is any action your landlord takes (or threatens to take) to punish you for engaging in one of the “protected activities” described below. Exercising any other right or remedy under law. How might my landlord try to retaliate against me? Refusing to renew your lease agreement. Please refer to Heat and Other Essential Services for more information. Please refer to Leases for more information. How can I prove that my landlord’s conduct is retaliatory? Keep a record of your “protected activities.” For instance, if you write a letter to your landlord asking him to make repairs, save the letter. Your landlord’s conduct is presumed to be retaliatory if it occurs within one year after you engaged in a “protected activity.” Your landlord may, of course, overcome this presumption by showing that he had a legitimate reason for terminating your lease, increasing your rent, etc. Heat, running water, hot water, electricity, gas,and plumbing. Who is responsible for paying for these services? That depends upon the terms of your lease agreement. What if I’m responsible for the cost of heating my apartment? Your landlord must give you a written statement setting forth the projected average monthly cost of heating your unit. (Your landlord must do this even if your tenancy is not governed by Chicago’s Residential Landlord and Tenant Ordinance). What if I get a shut-off notice because my landlord didn’t pay a utility bill? deduct from your rent the amount you pay the utility company. What is the first thing I should do if an essential service that my landlord is supposed to supply is shut off? You must first give your landlord written notice of this problem. THIS IS EXTREMELY IMPORTANT. After providing such notice, you have several options. These options are set forth in the answers to the next five written questions. Can I pay the utility company to restore the service? Yes, and you can deduct this payment from your rent. Make sure you get a receipt from the utility company so you can prove how much you paid. Can I buy something (such as a space heater) that can supply the essential service? Yes, and you can deduct from your rent the cost of what you’ve bought. Make sure you get a receipt for your purchase so you can prove how much you paid for it. Do not use a gas stove to heat the apartment! Can I sue my landlord? Yes, but contact an attorney first. He/she can help you sue your landlord for an amount that reflects the reduced value of your apartment plus attorney’s fees. Can I move out of my apartment and stay in a motel until the essential service is restored? Yes, and you do not have to pay rent for the period you’re in the motel or other temporary housing. Furthermore, you may deduct from your future rent payments the cost of this temporary housing (as long as it does not exceed your monthly rent). If my landlord doesn’t restore the essential service, can I terminate my lease? Yes, but only if your landlord doesn’t restore the service within 72 hours of receiving your written notice. If that happens, you can send your landlord another written notice stating that you are terminating the lease agreement. NOTE: You may not terminate your lease agreement for lack of an essential service if the utility company is unable to provide the service). If you terminate the lease, you must move within the next 30 days. Otherwise, your lease will remain in effect. What if a member of my family, a guest, or myself are responsible for the lack of service? In that case, you may not use any of the remedies set forth above. Am I entitled to notice if the building’s utilities are going to be disconnected? State whether the proposed termination will affect your apartment. What if my landlord fails to provide me with this notice? You can notify him/her, in writing, that you will terminate the lease agreement in no less than 14 days if he/she does not provide you with the required information. If you terminate the lease, you must move within the next 30 days. Otherwise, your lease will remain in effect. How warm should my apartment be? 68 degrees from 8:30 a.m. to 10:30 p.m.
66 degrees for all other times. What if my apartment is too cold? Record the temperature in your apartment three times a day for a week. 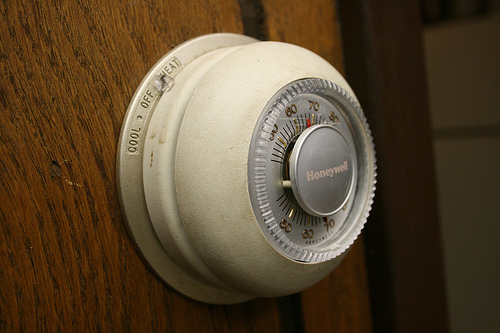 If these recordings show that your apartment is too cold, send your landlord a letter stating that he/she is violating the Chicago Municipal Code and must increase the temperature in your apartment. If he/she doesn’t comply with this demand, call the City’s Heat Hotline at 312/744-5000. What if my landlord shuts off my utility service in an attempt to force me out of the apartment? Call the police and an attorney. (For more information, see “Lock-outs and Retaliation“).